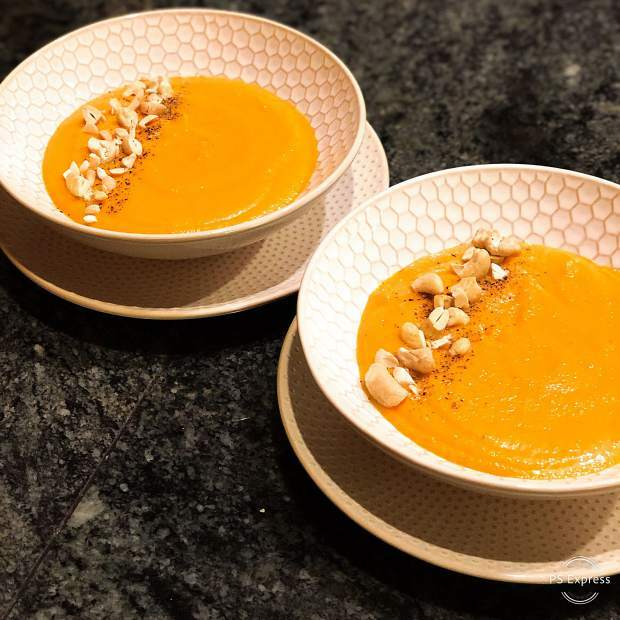 This carrot cauliflower Thai curry bisque is both healthy and delicious. This plant-based bisque is easy, healthy and delicious. Cauliflower is an anti-inflammatory vegetable loaded with vitamins, minerals and fiber, and carrots are not only high in fiber, but they also contain antioxidants that can help decrease the risk of cardiovascular disease. If you’d like to spice it up, add more curry paste or garnish the bisque with Sriracha sauce. In a medium stock pot heat coconut oil over medium-high heat. Add cauliflower, carrots, onion and garlic. Stir in the curry paste and salt; sauté for about five minutes. Once onions are translucent pour in broth and bring to a boil. Reduce heat to a simmer, cover and cook until the carrots are tender, about 20 minutes. When the carrots are tender pour in the coconut milk. Use an immersion blender (or a blender) to purée until smooth. Simmer gently over low heat for 10 minutes. Taste for salt and heat, adjust seasonings as desired. Pour bisque into bowls, garnish with chopped cashews or almonds and enjoy! Chef Arica Davis is owner/operator of Yummy Fixins and Personal Chef Services. Visit http://www.yummyfixins.com to book your next dinner party.